I went to the bookshop last week to get a present for my friend for her birthday. While I was browsing the bookshelves and wondering which book to get, this book leapt at me. My friend is a big football fan and so I thought this would be perfect. When I went to the counter to pay for the book and get it wrapped with gift paper, my heart was inside the book and I couldn’t stop thinking about it. Ignoring all the warnings from my brain, which screamed ‘Don’t do this!’, I went and got another copy of the book for myself 😁 As this is World Cup Football season, yesterday, I thought I will read it. The title of Simon Critchley’s book seems to be clearly inspired either by Raymond Carver’s short story, ‘What We Talk About When We Talk About Love‘. Or probably by Haruki Murakami’s book ‘What I Talk About When I Talk About Running‘. In this book, Simon Critchley explores the game of football from different perspectives – football’s roots in socialism and how it has transformed into a capitalistic game, why it is regarded as a beautiful game and what is the source of its beauty, the team nature of football and how within the team structure it nurtures individual talent, what does it mean to be a football, how players and fans get together and lose themselves in a match and how this creates the music and the magic, what it means to be a passionate football fan especially when one’s favourite team is losing, what does it mean to be a player and a manager, the role of football history, what tribalism and nationalism mean from a football perspective – Critchley explores these and other themes. As he is a philosopher, he sometimes uses philosophical concepts to explore football’s aesthetic beauty and the deeper meaning it might offer to players and fans. During this fascinating journey he also touches upon some of the great players and some of his favourite matches (I will give extra points to Critchley for mentioning one of my favourite players, Philippe Coutinho, whom he calls ‘The Little Master‘) to illuminate some of these themes in more depth. I loved Simon Critchley’s book. I have never read a book like this on football before. The typical football book is a ghosted biography of a famous player or a manager. During World Cup years, we see books which talk about the history of the World Cup. Sometimes there are books with lots of beautiful, colour photographs. It is very rare to find a book which looks at the overall game and explores its beauty and its meaning. Atleast I haven’t seen one. There are books like this on cricket. The one that comes to mind immediately is ‘Beyond a Boundary‘ by C.L.R.James. The closest football book to that till now is probably Nick Hornby’s ‘Fever Pitch‘. One of the reasons for this might be that football is a truly international game which is played not just in English speaking countries. There might be books on football written in Spanish or French or German or Italian or Portuguese, but these are not translated into English and so they are not accessible to an English-reading audience. In English, the bookshelf is really thin. So, Critchley’s book breaks new ground and takes us through unexplored territory. I am happy to say that it succeeds spectacularly. ‘What We Think About When We Think About Football‘ is probably football’s answer to C.L.R.James‘ masterly work ‘Beyond a Boundary‘ and Haruki Murakami’s charming ‘What I Talk About When I Talk About Running‘. It is beautiful, engaging, brilliant, sometimes challenging, many times delightful, and filled with love for the game. It has many photographs interleaved between the pages of text, which add to its charm. Simon Critchley’s prose is accessible and engaging, sometimes beautiful, sometimes intellectually challenging when he puts his philosopher hat on, but always insightful and always readable. I hope this book becomes a classic. If you are a football fan, go and read it now, because this is the perfect time to read this beautiful book. Have you read ‘What We Think About When We Think About Football‘? What do you think about it? A few days back when I was wondering which book to read next, Jeanette Winterson’s ‘The Stone Gods‘ leapt at me. I went on a book search to find out where it was and discovered it deep inside the bookshelf. I finished reading it today. ‘The Stone Gods‘ is science fiction. The first part of the story, which spans nearly half the book, is set in a futuristic world. Science and technology is highly developed, people eat and drink synthetically made food, people can genetically freeze their age and always look young, space travel is highly evolved, humans have robots to do many tasks. But some of the old human flaws and vanities remain – the difference between the haves and have-nots, how celebrities still try to differentiate themselves when everyone looks young. But the most important thing is this. Humans have polluted the planet, there have been wars, things are bad, and in the not-so-distant future, the planet might turn out to be uninhabitable. Then the scientists discover a new planet. It has everything that is required for human life. There are some big, dangerous animals there though, like dinosaurs. So a spaceship goes there on a mission. The plan is to humanely kill the dinosaurs and help establish a human colony there. Once things are setup and stabilized there, the plan is for people to start moving there. Of course, things don’t go according to plan. What happens after that is told in the rest of part one. In part two, the story takes us to the 1770s, when Captain Cook visits Easter Island and describes what happens then. In the the third and fourth parts of the book, the events happen closer to our time. How these three story strands are woven together into one fabric is revealed finally. I felt that the first part of ‘The Stone Gods‘, which covered nearly half of the book, was the strongest. But all the different story strands were interesting in their own way. The surprise that is revealed in the end is interesting, but I think I saw it coming. The book says some interesting things about our world and where it is going – offering a commentary on the human condition – and it is hard to disagree with it. Jeanette Winterson’s prose is charming, irreverent and humorous and is a pleasure to read. I loved most of the characters in the book, but my favourite was a robot who is almost human, called Spike. She is cool, stylish and charming. An interesting thing happened, when I started reading the book. The narrator of the first part of the story is called Billie Crusoe. I made an automatic assumption that Billie was a man and he was straight because later he falls in love with a woman. Imagine my surprise when I discover that Billie Crusoe is a woman and she is (probably) a lesbian. There is a word called ‘hereronormative‘. I think I first saw it in a book called ‘The Argonauts‘ by Maggie Nelson. In my understanding, it means that when we get introduced to a new character in a story, we automatically assume that the person is straight. I also went one step ahead and assumed that the narrator is a man. In my defence, I have never seen a female Billie in fiction. But when I think about it, I realize that there is Billie Piper, the English actress, who is famous for her wonderful roles in ‘Doctor Who‘ and ‘Penny Dreadful‘. We keep an open mind, guard ourselves against making assumptions, but traditional conditioning just creeps in silently and unexpectedly. That is what I realized when I thought about all this. I liked ‘The Stone Gods‘. This is my first Jeanette Winterson book and I am happy to discover that she has a long backlist. I can’t wait to read more of her books. “There’s a planet,” said Spike, “made of water, entirely of water, where every solid thing is its watery equivalent. There are no seas because there is no land. There are no rivers because there are no banks. There is no thirst because there is no dry. “The trouble with babies is that they are made like a safe – no way to see what’s inside and no guarantee that the effort will be worth the trouble. Spin the numbers, crack the code, but the door won’t swing open. Babies are safes on a time-delay. It takes years for the door to swing open, and even when it does, the best minds are undecided as to the value of the contents. “You can change everything about yourself – your name, your home, your skin colour, your gender, even your parents, your private history – but you can’t change the time you were born in, or what it is you will have to live through. Have you read ‘The Stone Gods‘? What do you think about it? ‘Julius Winsome‘ by Gerard Donovan was highly recommended to me by a couple of friends from my book club. I hadn’t heard of Gerard Donovan before and was excited to explore a new writer. “By the time I was back in the cabin and stirring the fire, I missed him for the first time, missed him with a hammerstrike against the heart, the awful moment when you know what gone really means. It means no one sees how you live, what you do. That thing which creeps into his house along with the sadness, it darkens his heart, makes him thirst for revenge. What happens after that, what Julius does about it, is he able to find who killed Hobbes, is he able to take his revenge – these form the rest of the story. ‘Julius Winsome‘ is a beautiful study of loneliness, of solitude. It belongs in the category of the great introvert novels – like Patrick Süskind’s ‘The Pigeon‘ and ‘Perfume‘ and J.K.Huysmans‘ ‘Downstream‘ and ‘Against Nature‘, Robert Seethaler’s ‘A Whole Life‘, Denis Thériault’s ‘The Peculiar Life of a Lonely Postman‘ and Alexis M. Smith’s ‘Glaciers‘. It describes what happens when an introvert sits in his cabin, sipping tea, reading his favourite book, and minding his own business, and the outside world suddenly enters his life, explodes into his life, changing it upside down. What happens is surprising and even amazing, and sometimes we may not even approve of what is happening, but if one is an introvert (not the introvert who claims to be one, but spends most evenings and weekends with friends and other people and has a busy social life, but the one who is the real deal, the introvert who spends a Saturday evening reading a book rather than catching up with friends, who watches movies alone because she / he hates other people when they talk during a movie, who hates talking on the phone but prefers texting, that kind of introvert), one can understand why things are happening the way they do. Gerard Donovan clearly loves Shakespeare and he passes on that love to the narrator whose account is filled with Shakespearean words and we find interesting scenes in which two people are pointing a gun at each other and the narrator quotes Shakespeare and the person on the opposite side says ‘What?? ?‘ 🙂 I loved those scenes. It made me remember a Tamil movie called ‘Anniyan‘ in which the main character quotes Sanskrit shlokas to the bad guys and their faces widen with a bewildered look. After the initial cozy start and the subsequent tragedy, the story acquires the pace of a thriller and we want to turn the page to find out what happens next. It was interesting to see the story transforming in shape and become something new and different but which has deep roots in its past. Gerard Donovan’s prose is spare and beautiful and the narrative is interspersed with beautiful sentences and passages. The story has an interesting ending, something that I didn’t expect. I loved ‘Julius Winsome‘. It is a beautiful story of solitude, love, friendship, loss, revenge, war, violence, redemption. It is also a beautiful story about the friendship between humans and dogs and a beautiful story about the love for literature and Shakespeare. I can’t wait to read more books by Gerard Donovan. Have you read ‘Julius Winsome‘? What do you think about it? 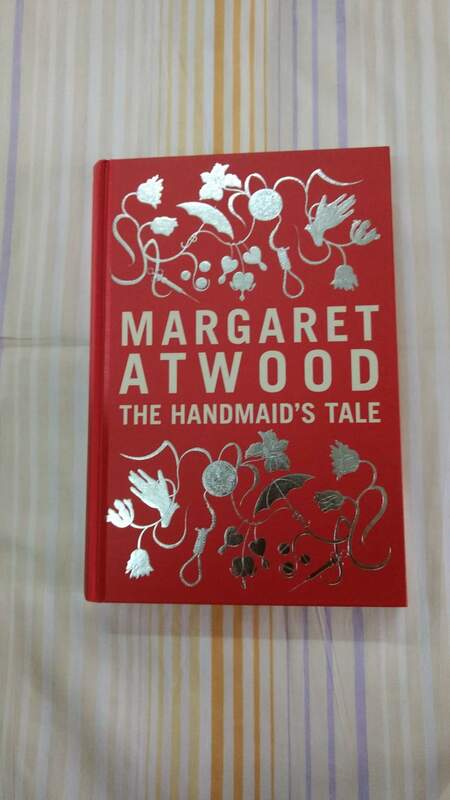 I have wanted to read Margaret Atwood’s ‘The Handmaid’s Tale‘ for sometime now. I was in two minds on whether to watch the TV adaptation first or read the book first. Because I like surprises being revealed on TV, while I don’t mind reading a book even after I know the story. But, in general, I am a books-first person, and so this turned out to be an unresolved problem which dogged me everyday. Then finally one day, I buckled and watched the TV adaptation first. I loved it very much. Then I read the book. This post is about the book. I have shared some thoughts on the TV adaptation too at the end. ‘The Handmaid’s Tale‘ is set in a dystopian world, maybe sometime in the last decade of the twentieth century or early in the twenty-first century. In this world, in the recent past, some bad things have happened, there is environmental pollution, there are wars, most people find it impossible to have children as something in the environment has affected their bodies. Many people are unemployed and have started hating the government. A group of influential people in America get together, fight against the government, overthrow it, call themselves the Republic of Gilead, and promise to fix all the problems. One of the first things the new government does is to ban women from any kind of employment. So, that is one problem solved – unemployment has been eliminated. Like the Nazis did. Then they round up women, who they don’t approve of – because they married a second time, because they tried running away from the country when the new regime came in, because they were in professions that the government has banned – pick the ones who can still have children, call them handmaids, puts them through a tough and cruel programme to break them and remove any kind of rebellious or independent thought from them, and they assign them to powerful leaders’ homes to play the role of surrogate mothers and have kids for them. This story is told by one of those handmaids called Offred. For the rest of the story, you should read the book. One of the scary things about the book is that most of the stuff described in it has happened in one way or another in some country in the past century or so. Women being forced to stay at home, women forced to wear a particular kind of dress, soldiers everywhere in the city, people’s movements being restricted around town, schools and colleges being closed, spies everywhere who can report anything to the authorities including spies among neighbours and in one’s family and household, women’s reproductive functions being controlled by the government which is mostly made up of men – all these and more have happened. Some of these are still continuing to happen. As Margaret Atwood says in her introduction to the new edition of this book, she didn’t write anything new. She took the things that were already there, put them all in one place and tried to imagine what happened. And what happens in the story is scary. It is hard to read. I loved the way the characters in the book are depicted – well fleshed out, imperfect, flawed. 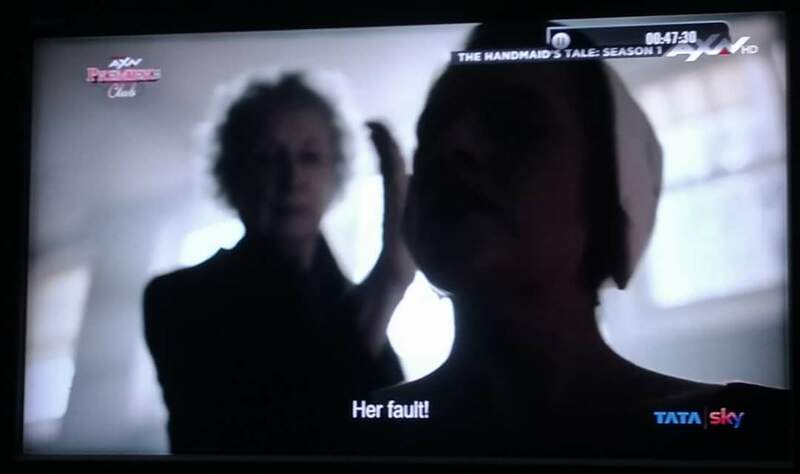 Offred is a wonderful narrator and the other main characters – Moira, Cora, Rita, Offglen, Serena, the Commander, Aunt Lydia – they are all well depicted. I loved Moira and Cora. Atwood’s prose is spare and she uses minimal punctuation, even in dialogues – it made me think of James Joyce, Nicole Brossard, Cormac McCarthy. Most of the book is dark and bleak, but when Atwood is in the mood, the contemplative passages flow smoothly like a serene river. After sometime, I looked forward to those beautiful passages and waited for them with anticipation. Now about the TV adaptation. The TV adaptation takes a lot of liberties with the book, many of them small, some of them big. For example, in one case, it merges two characters, creating a composite character. Some of the characters in the adaptation are younger than in the novel. Some of them have stronger stories and get more screentime than in the novel. In the case of a couple of characters, their story arc extends well beyond the book. Many of the characters are more likeable in the TV adaptation. The TV adaptation also introduces some new characters who are not there in the book. One of them was one of my favourites. The TV adaptation also has some events rearranged when compared to the book. Sometimes there are new events which are not there in the book. Interestingly, many of these additions and modifications enhance the dramatic intensity of the story. In some ways, the TV adaptation improves upon the book. Which happens very rarely. It must have helped because Atwood has been closely involved in the TV adaptation. She also appears in a scene at the beginning as an Aunt, and gives a big slap to Offred. The TV adaptation has a wonderful cast too and is brilliant. Samira Wiley as Moira was so perfect. And lastly, about some of the famous lines in the book and the TV adaptation. Everytime I hear ‘Blessed be the fruit‘, ‘May the Lord open‘, ‘Praised be‘, and ‘Under his eye‘, I feel a shiver down my spine. And everytime I remember ‘Nolite te bastardes carborundum‘ (‘Don’t let the bastards grind you down‘), I get goosebumps. Words are powerful, especially in context. I loved ‘The Handmaid’s Tale‘. It took me a while to read it, but I am glad I finally read it. The edition I read was incredibly beautiful – red cover with a beautiful design, hardback, thick pages with big font, no introduction, no footnotes or any notes, just me and the book, with no distractions, as if it was saying that the proof of the pudding was in the eating it. I loved that. I must be the last person on earth to read it, but if you haven’t read it yet, I highly recommend it. Have you read ‘The Handmaid’s Tale‘? What do you think about it? I started reading this book nearly a month back. It is a chunkster at nearly 900 pages, but still I didn’t think it would take so long. But I refused to give up or get distracted by other shiny new books, and I persisted. Yesterday, when I read the last word, on the last page, I was very happy and thrilled. I have always thought that Ray Bradbury was a science fiction writer. I hadn’t read any of his stories or books when I thought that. Then one of my friends who was a huge fan of Bradbury introduced ‘Dandelion Wine‘ to me. I read it and I loved it and it immediately found a place on my list of favourite books. It was the most beautiful evocation of summer that I have ever read. Then I thought that Bradbury wrote science fiction and stories about small-town America. Then someone told me about ‘Fahrenheit 451‘. Then I thought – “Okay. Bradbury writes science fiction + small town America + dystopia“. Then I read this book. And now I realize that whatever I thought about Bradbury was wrong. He was a writer who refused to get slotted into one genre, refused to be pigeon-holed. He wrote about anything and everything which caught his fancy and he defied other’s attempts to classify his stories. This book has 100 stories, all selected by Ray Bradbury himself. There is science fiction, there are stories of small town America. But there are also horror stories, stories about vampires, dinosaur stories, noir crime stories, detective stories, murder mysteries, love stories, family stories, Irish stories, Mexican stories. Even the science fiction is diverse – the regular space travel stuff is there, there are Martian stories, there are time travel stories, there are stories of dinosaurs and strange sea creatures, and other stories which are hard to classify. There are science fiction stories which offer commentary on our modern networked world in which we are connected all the time through social media. Bradbury wrote that story decades back, before the advent of the smartphone and the internet, and the insights the story offers are amazing. This story is called ‘The Murderer‘. The Irish stories show beautiful aspects of Irish culture and how people took pleasure and got happiness from the small things when their country was going through a tough time. My favourite Irish story was ‘The Anthem Sprinters‘. There were many stories which bore a close resemblance to longer novels by other authors and movies, which came later. I am wondering whether these authors and movie makers were inspired by Bradbury’s stories. ‘The Small Assassin‘ looked remarkably similar to the movie ‘The Omen‘, but without the religious connotations. “You realize you are alone. You and your mother. Her hand trembles. Homecoming – There is a strange family who look like humans during normal times. We are never told what they are, but we suspect that they are vampires. They are having a great gathering and celebration and all their relatives are visiting. There are all kinds of creatures among their relatives. The youngest member of the family, Timothy, is different from the rest. He sleeps during the night, is awake during the day, eats normal food. How this outsider lives his life in a family filled with people who have strange powers forms the rest of the story. The Scythe – It is a story in which a man and his family, who are struggling to make ends meet, find a house in the middle of nowhere, with everything they want, and a document which says that the house and surrounding lands belong to them now. But, of course, nothing comes for free in life, and there is a deep horror lurking there in the house and around. Kaleidoscope – A rocket explodes and the astronauts inside are thrown out in different directions. They have a short period of radio time left, before they lose contact, and in that time they start discussing the meaning of life and they start saying nice things and mean things to each other. What starts as a science fiction story, ends up becoming a story which asks the big questions about life and it is incredibly beautiful. The Veldt – A couple get a futuristic playroom for their kids. But when the playroom door is closed, it looks like something scary has stepped into the room, like a real life version of ‘Jumanji’. The Fire Balloons – A group of priests go to Mars to meet Martians and initiate them into the ways of religion. But they are in for a surprise. Hail and Farewell – A beautiful story of a boy who doesn’t grow up. The Great Wide World Over There – A story of a middle-aged woman who can’t read and write, who discovers the pleasures of receiving letters. Very beautiful. I cried after I read the story. The Small Assassin – A story about a newborn baby who is fully aware of his surroundings, doesn’t have any moral sense of right and wrong, hates his parents for bringing him into the world, and tries to hurt them. Very scary. Very similar to ‘The Omen’. Calling Mexico – A story about an old man in his last days, who tries to bring back his past with a small act. Very beautiful and poignant. The Day it Rained Forever – A story about three old men who are waiting for the rain and then something happens. You have to read the story to find out what happened. The Town Where No One Got Off – A travelling salesman gets off the train, one day, at a town where no one gets off. Surprising things happen then. A very interesting, philosophical noir crime story. The Anthem Sprinters – A beautiful depiction of Irish culture. The Terrible Conflagration up at the Place – a story about a few young men who want to burn down an Irish lord’s house. What happens is beautiful and charming. Tomorrow’s Child – A woman gives birth. But the thing she has given birth to, looks like a blue pyramid. The doctor says that it is a live, healthy baby. Why it looks like a blue pyramid and what the parents do about it is told in the rest of the story. A very beautiful story about parents and children, family and love. I Sing the Body Electric! – in which the narrator talks about his unusual grandma. She is one of my favourite grandma characters ever. A Story of Love – a beautiful, unusual love story. The Better Part of Wisdom – another beautiful, unusual love story. What is left unsaid is so beautiful. I don’t think I would have understood this story when I was in my teens. Interval in Sunlight – it describes the life of a couple and how the husband harasses the wife everyday, with every word he speaks. It made me angry more and more as I read the story. I hated that husband character. But the way Bradbury makes it all look so real – it is scary. Full marks to him. The Sound of Thunder – A man travels to the past to hunt a Tyrannosaurus Rex. But this can’t go well, can it? You can’t just go and hunt a Tyrannosaurus! What was he thinking?? The Shoreline at Sunset – Two young men discover that something has been washed by the seashore. They go and have a look and discover that she is a mermaid. What happens after that is told in the rest of the story. There are also a couple of stories set in the planet Venus. Venus is depicted as a planet where it rains most of the time and the sun rises only once in a while, maybe once in a few years. ‘The Long Rain‘ depicts the rainy aspect very beautifully, while ‘All Summer in a Day‘ depicts the sun rising part very well. There are a few stories set in other unnamed planets too. In ‘The One Who Waits‘, the narrator is a native of the planet that humans visit. How the narrator looks like and what is the nature of the narrator – we don’t know. What happens when the worlds of these two beings collide is depicted in the story. It is very scary. In ‘Frost and Fire‘, which was one of the longest stories in the book, at 32 pages, and which is one of my favourites, a baby is born to parents. But his parents are not happy. The baby grows up rapidly. It soon discovers that its lifetime is eight days and within that time, it has to enjoy childhood, learn skills, become an adult, find a mate, have kids and bring up its kids. It also discovers that its ancestors were humans who settled down in this planet and something in this planet shortened and accelerated their lifespan. What the baby does about this forms the rest of the story. Very fast paced and gripping. 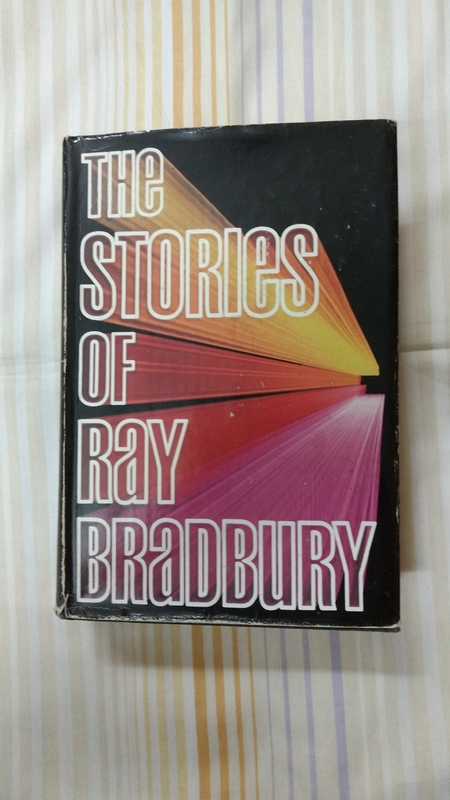 I loved ‘The Stories of Ray Bradbury‘. It was 894 pages of pure reading pleasure! There is something in it for everyone. I am glad I finally read it. If you get a chance do read it and share your thoughts.